I’m taking a stand. Pumpkin spice will not take over my seasonal baking. Apple cinnamon deserves to be back on top. Apple cinnamon has become the Jan Brady of fall flavors, sitting around going “Marsha, Marsha, Marsha” while everyone freaks out over pumpkin spice. Yes, it’s not the most exciting or trendy thing anymore, so we take it for granted, but I think it deserves more credit. The nostalgia factor is huge here. I have always requested apple pie for Thanksgiving dessert. Also, I think there was a year of high school that I ate those frozen toaster strudels everyday. Always the apple ones. I actually had to stop eating them for a while because I burnt out on them, but obviously, I got over that. Look, there’s nothing wrong with pumpkin. I like it, but since everything out there on the market these days is pushing pumpkin spice, I thought I’d give you three quick recipes for reuniting with your first fall love. 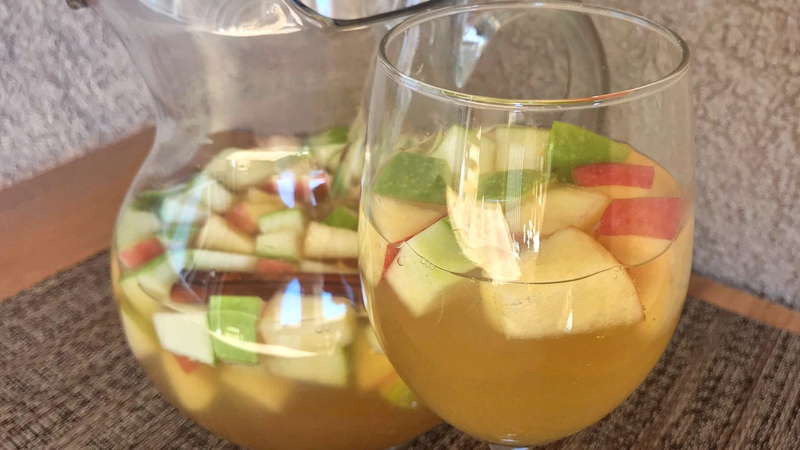 Before we start… I used honeycrisp and granny smith apples for each recipe. I like using two kinds of apple for a couple different flavors. 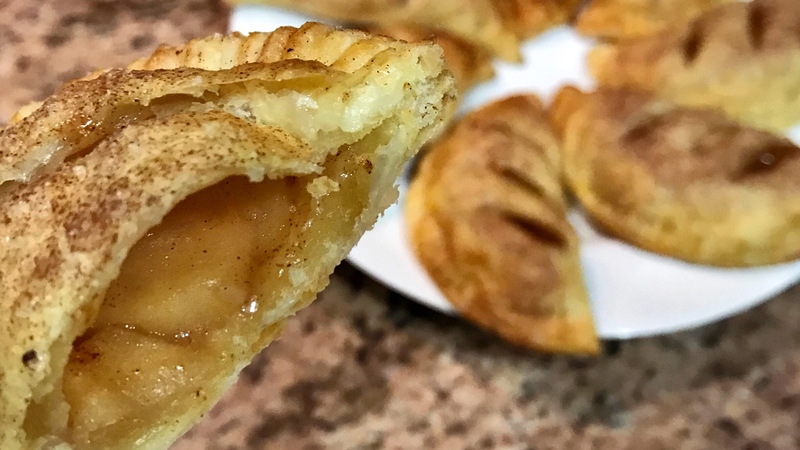 Of course you can swap these out for whatever your favorites are, but I really recommend using a tart apple and something sweet to balance it out. If you don’t know what to pick, here’s a helpful guide from Whole Foods. Preheat the oven to 225 degrees. Preferably with a mandolin, slice both apples very thinly. Remove all seeds. 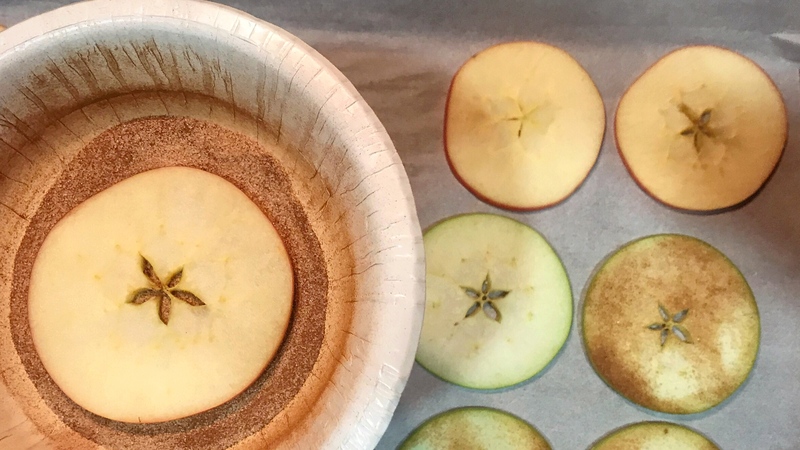 Combine sugar and cinnamon in a bowl, and drop each apple slice in one at a time and flip to coat. Place the apple slices on a parchment lined backing sheet. Bake for an hour or two, flipping the apples every 30 minutes. Use a paper bowl for the cinnamon sugar… between that and the parchment, clean up is easy! If you prefer a chewier bite, cook them for only an hour. You can leave them in until they are as crisp as you want them to be, but just check when you are flipping that the sugar isn’t burning. Cooking times can vary depending on how thick/thin they are, so this is one recipe you just have to keep an eye on. These are a great healthy snack! Despite the sugar, you still totally taste the apple flavor. 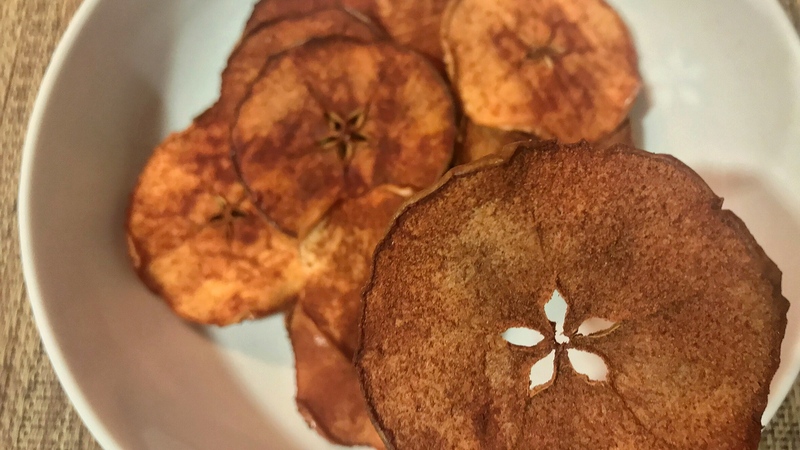 You could drizzle them with some caramel sauce and serve them up as a sweet snack for a fall party, put them in a leafy salad for some texture or replace greasy potato chips as a sandwich side. 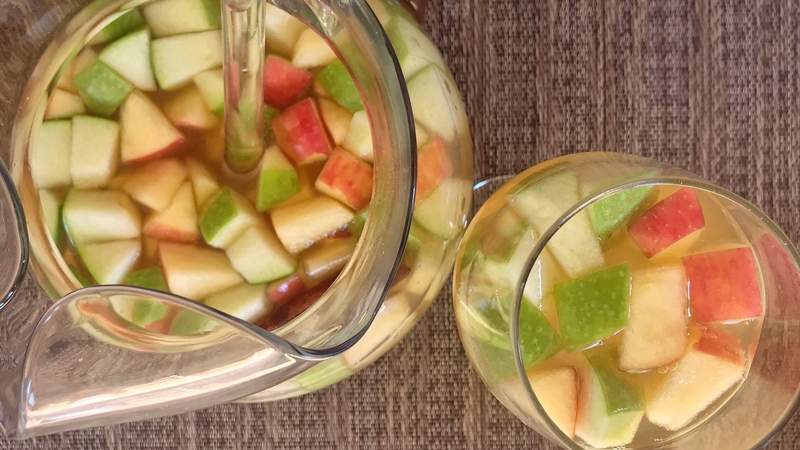 Let the apples absorb the lemon juice for a minute, then add the cinnamon sticks, rum and apple cider to the pitcher. Refrigerate for 1-2 hours. Give the contents of the pitcher a stir then pour in the champagne. 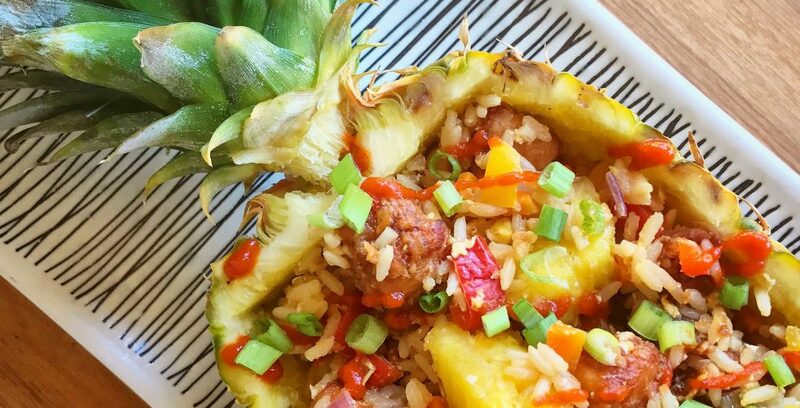 Serve immediately, with fruit. This is becoming a staple on weekends around here. This is the perfect cocktail for a autumn afternoon full of football or scary movies. The best part is eating all that fruit that soaks up the sangria! P.S. The point of sangria is to fancy up cheap wines, so don’t blow your budget. Get some Andre or Cook’s, you know what I’m talking about. A bottle of wine or bubbly going into a sangria should be south of $10. 1 can of apple pie filling OR follow this easy recipe I followed to make my own! Preheat the oven to 400 degrees. Mix the egg yolk and water together to create an egg wash in a small bowl. Place a spoonful of the apple pie filling in the center of each circle, away from the edge. Using a pastry brush or your finger, coat the very edge of the circle with the egg wash. Fold the dough in half and use a fork to crimp the edges together, creating a half moon shape. Brush the whole top of the pie with egg wash and slice three small slits on top to vent. Combine the sugar and cinnamon and sprinkle it over the pies. Place them on a lined or greased baking sheet and bake for 20-25 minutes, until golden brown. 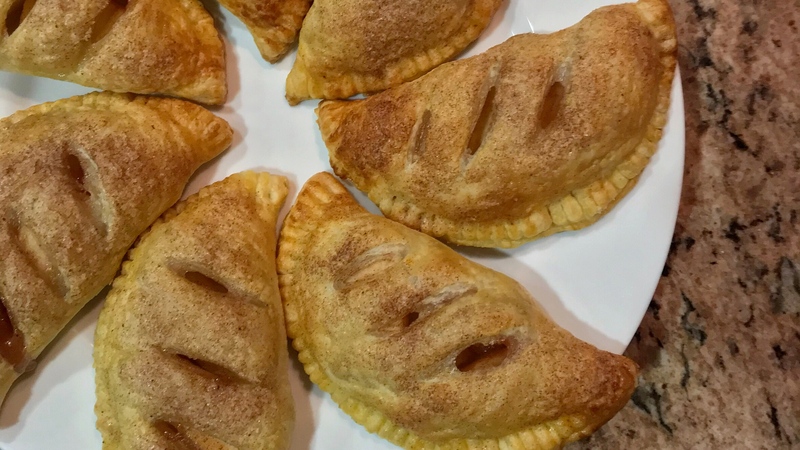 So I have done these a couple times with the canned apple pie filling, and it works out so well. Plus, it takes away half the work and you can have “homemade” pies in no time that make everyone think you spent hours on them. This time I decided to make my own filling and to jar the rest for future baking, and it was super easy! If you went apple picking or just have a lot of them laying around, I’d say make your own. If you want to keep it simple, or maybe want to get the kids involved in helping make these, go with the canned. Wrap these guys up individually in plastic wrap and they will last for a few days. They make a great sweet breakfast on the go! There you have it. Three different recipes using apples. Bonus points to anyone who goes all out and makes all three of these in one day! Send me pics if you do. Where do you stand in the apple vs pumpkin debate? I hope I made a good argument for my beloved apples today. Let me know what you think of these recipes, or what your favorite fall treats are!